1911 (i.e. third impression, reprint of the second impression, 1916). ‘The importance of the part of the Pen has played in the development of letters cannot be over-estimated; and I believe that it is beginning to be recognised that the best way to study letters, or even to “design” them, is to practise oneself in the use of a broad-nibbed pen…’. So wrote Edward Johnston in his Manuscript & Inscription Letters for Schools & Classes & for the Use of Craftsmen. Gill attended Johnston’s calligraphy classes at the Central School of Arts and Crafts in London in 1901 and was no doubt inculcated into the master’s mantra of a systematic and careful approach towards lettering. The seed, however, had been sown. While at Chichester (1897-1900) Gill became ‘mad’ on lettering, writing in his diary that ‘letters were something special in themselves’… they are ‘things, not pictures of things’. Here is A.E.R. Gill’s ‘Raised Letters’ carved on Hopton Wood stone, a type of limestone which is almost like marble. 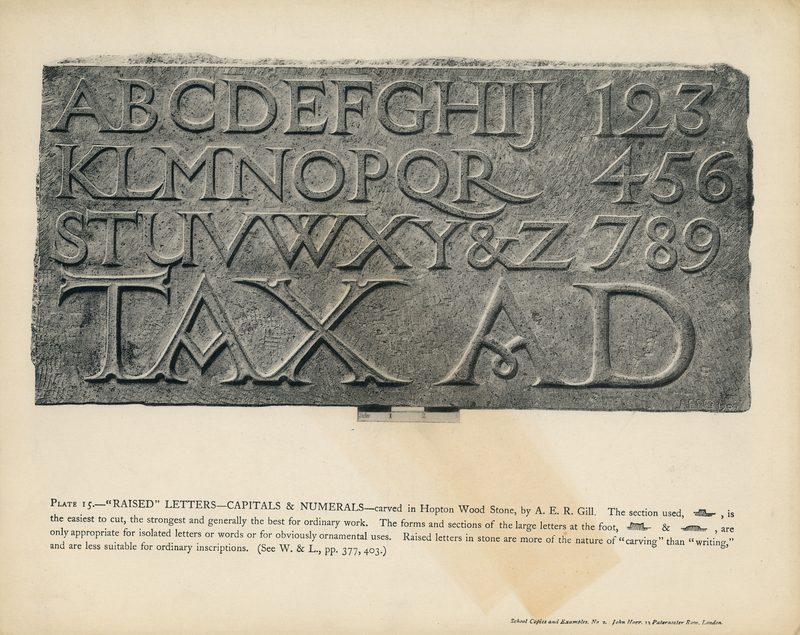 Edward Johnston, “‘Plate 15’ from Manuscript & Inscription Letters for Schools & Classes & for the Use of Craftsmen,” ourheritage.ac.nz | OUR Heritage, accessed April 20, 2019, http://ourheritage.ac.nz/items/show/9288.